Discussion in 'Fashion... In Depth' started by ellastica, Feb 6, 2019. What is remarkable — given the rumors last month that Ms. Wintour was going to be replaced by the French Vogue editor Carine Roitfeld — is that she was able to include not merely a critical view but one that accurately identifies the problem with the magazine. Vogue has become stale and predictable, and it has happened in spite of some of the best editors, writers and photographers in the business. And it has happened in spite of a leader who “only cares what readers care about,” according to a long-time staff member. Because of her intimidating presence, heightened by an almost unvarying personal style — the bob, the sunglasses, the extra armor of her Cheeverish clothes — Ms. Wintour, 59, is considered the ultimate fashion editor. In fact, her instincts are really those of a journalist. 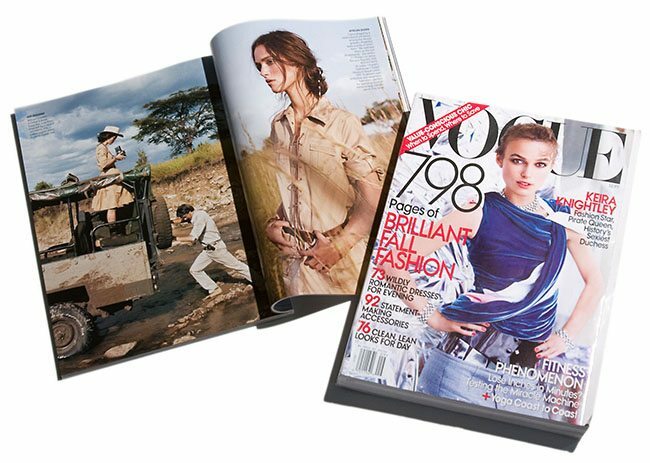 She has periodically updated Vogue over the last 20 years to reflect changes in the world and in women’s lives. She has introduced new photographers, beginning in the late 1980s with Peter Lindbergh and Steven Meisel. At the same time she has a deep respect for the work of Irving Penn, as if she knows that Mr. Penn, however contemporary his pictures, is part of the mysterious link to Vogue’s — and fashion’s — past. “That’s the main reason I keep looking in the magazine, to see a photograph by Penn,” said Magnus Berger, an editor in his 30s who, with Tenzin Wild, recently started a publication called The Last Magazine, an oversize journal that is a blend of art book and newspaper and which its founders hope will be a platform for young talent. This sense of history, which enriches Vogue, is much less evident today in other fashion glossies. It has been nearly wiped away at Harper’s Bazaar. An avid follower of politics, as well as sports, she has broadened Vogue’s coverage in both arenas and put a first lady on the cover. It was one of the first national publications to write about Sarah Palin. For all the fantasy in Vogue, especially the fairy-tale kind produced by Grace Coddington, the creative director, and Annie Leibovitz, the magazine is actually quite serious. There are things to read, long pieces, from writers with distinct voices: Julia Reed on politics, Jeffrey Steingarten on food, Sarah Mower on the Paris collections. And unlike many of her rivals, Ms. Wintour, who declined to be interviewed for this article, has largely resisted the pressure to break down content to lists and small bites. Though this faster, drive-thru approach to editorial consumption may be what more people want. Meanwhile, though, many people have all but abandoned traditional media for Web sites and blogs. This is the locus of Ms. Wintour’s harshest critics and where rumors first surfaced that she was going to be replaced by the 50ish Ms. Roitfeld, who has made French Vogue exciting in part by drawing on the sexiness of her own act. She knows how to play with fashion’s self-referential habits. The rumors were silly — Ms. Roitfeld runs a magazine with a circulation of 133,000, in contrast to American Vogue’s 1.2 million. But silly or not, they were extravagantly denied by Condé Nast, which took out a two-page ad in The New York Times to show Ms. Wintour’s record. 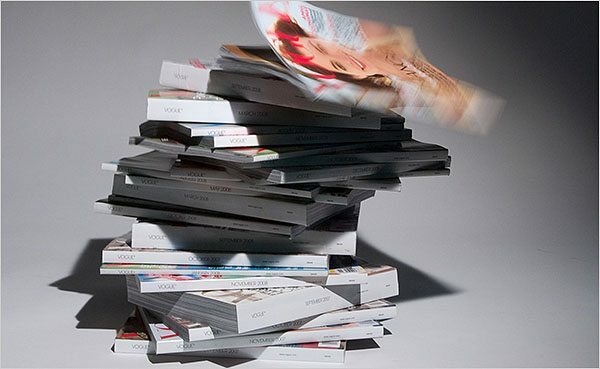 It cited figures showing that Vogue had the highest number of advertising pages of any fashion magazine. Yet, in 2008, Vogue’s ad pages were down 9.6 percent, Mediaweek said, compared with an average 8 percent decline for other fashion magazines. 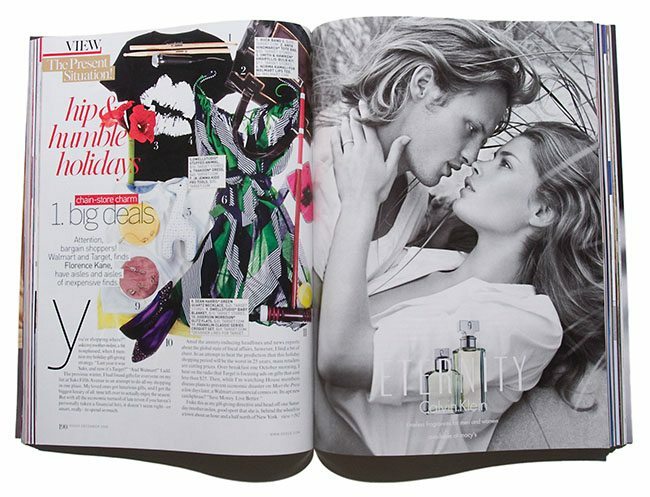 Rivals like Elle and Harper’s Bazaar, which have adopted a pell-mell style that encourages value-for-money nibbling, have fared better. The very qualities that set Vogue apart — consummate fashion judgment, a comfortableness with ideas in the shallow pool of celebrity and weight-loss articles — now seem to be narrowing its view, like an aperture shutting down. There are too many stories about socialites — or, at any rate, too few such stories that sufficiently demonstrate why we should care about these creatures. What once felt like a jolly skip through Bergdorf now feels like an intravenous feed. To read Vogue in recent years is to wonder about the peculiar fascination for the “villa in Tuscany” story. Ditto staff-member accounts of spa treatments and haircuts. It’s embarrassing to see how Vogue deals with the recession. For the December issue, it sent a writer off to discover the “charms” of Wal-Mart and Target. 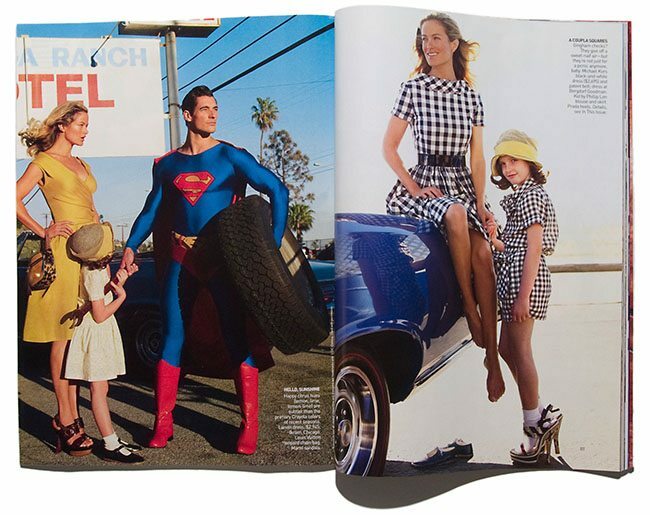 A similar obtuseness permeates a fashion spread in the January issue, where a model and a child are portrayed on a weekend outing with a Superman figure. Is a ’50s suburban frock emblematic of the mortgage meltdown? To ask what works in Vogue is in a sense to ask the same of all fashion magazines. Many do not seem to know how to relate to women in their 20s, except to throw celebrity pictures and clothes at them. Although the median age of its readers has hovered around 34 since Ms. Wintour became editor, in 1988, you don’t feel that the magazine has considered how changes like social networks and Web-based subcultures have influenced women’s ideas about themselves. This lack of awareness is reflected in Vogue’s pages. A version of this article appears in print on , on Page E1 of the New York edition with the headline: What’s Wrong With Vogue?. I was about to say: "why has Vogue published a letter in 2019 with criticisms that were valid sometime around 2009?" when I saw the date that article was first published. Imagine a moment when US Vogue's problems amounted to having Sienna Miller on the cover too many times for some - probably most - people's tastes. Whereas in 2019: What's right with Vogue? how things change. The past decade has been catastrophic for print. Strange to read this and realise that the biggest problems back then were stale cover stars and content. Now its more like.. can we afford to still print 12 issues a year?